This time of year does your skin start to look pale, a little red and bumpy, and beyond dry? I can relate. Well, I guess, I could relate. I always gazed at those people that their skin always looked even toned, moisturized, and beautiful no matter the time of year. I never knew how some people did it – many probably just good luck but some, they work for it. So I decided to work for it too and I made the small investment in a dry brush. The entire dry brushing process only takes about 3-5 minutes and can really make a difference in the look and glow of your skin. This is the dry brush that I use. How to Dry Brush? What is my Dry Brushing Technique? First, you want to make sure your dry brush has hard natural bristles. You don’t want them to feel like sandpaper but you also don’t want them to be easily squished down. Many people like a brush with a longer arm to reach hard-to-reach areas, however, I just have a little handheld one and it works just fine! You always want to start at your feet and work your way up. You will always want to brush towards your heart to avoid ruptured blood vessels and varicose veins. Brush with firm pressure in long sweeping motions. On places like your knees, elbows, and bottoms of your feet that have tougher skin, feel free to press firmer. On places like your stomach, behind your knees, and your chest area with thinner skin, make sure to be gentle. This doesn’t have to be exact. You just want to make sure you hit each part of your skin at least twice with the brush. Don’t forget your armpits! One of the biggest benefits of dry brushing is that it stimulates your lymph nodes. Your armpits are one of the parts of your with the most lymph nodes so it is a key spot to brush to get maximum benefit. Your digestive system moves clockwise on your stomach. It is said to help improve digestion if you correspond your dry brushing in the same way! Once you are done, jump in the shower to wash any excess dead skin cells off! Note: It is completely normal to be a little red and tingly after you brush in the beginning! You skin will adjust over time! This is nothing to worry about! I personally use coconut oil with tea tree oil as my daily lotion. I feel like it keeps my skin the most glowy and hydrated throughout the day. That’s it! You’re done with your dry brushing technique for the day! Your brush can collect lots of dead skin cells – yuck! So I just rinse mine under the sink once a week and I spray it with a tea tree oil spray (.5oz witch hazel, .5oz water, 4 drops of tea tree) a few times a month. 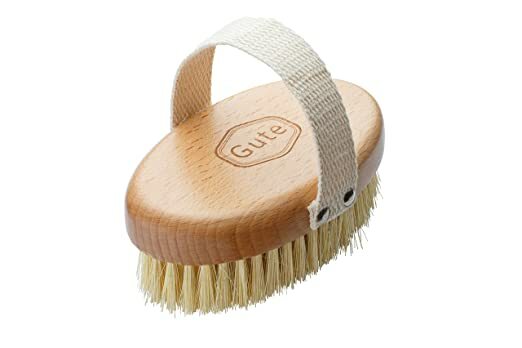 Dry brushing may help stimulate the skin cells and break down toxins beneath the skin. These toxins may reduce the appearance of cellulite. There are many strong believers in this! Your skin loses 30,000-40,000 dead skin cells every minute. (Whaaat?) And dry brushing helps to break this skin cells loose at the time of brushing. With fewer skin cells on your skin, you are reducing the risk of clogged pores, ingrown hairs, and red marks on your skin. Your Lymphatic System is in charge of filtering toxins, waste, and unwanted material from inside your body. This includes parts of your immune system too! A strong Lymphatic System can fight colds and flus easier! Dry brushing can be extremely relaxing. I have read stories of people using it as a form of meditation each morning. Take the extra few minutes on yourself. Get your blood circulation moving and enjoy the glow of your skin! I have been dry brushing my skin for about 3 months now. The reason I started was because I always hated the keratosis pilaris (KP) on the back on my arms and legs. keratosis pilaris is little red bumps that are caused by a build up of dead skin in a hair follicle. It is super common and absolutely harmless. However, I hated how it looked! So I checked out how to naturally fix keratosis pilaris and dry brushing (and following with coconut and tea tree oil) came up with all sorts of other benefits too! So I thought I’d give it a try! Within a month, the appearance of my keratosis pilaris was almost gone! So I kept up with it and it continues to get better. I stopped dry brushing for about 2 weeks and it gradually got worse again. Since starting dry brushing, I can clearly see a difference in the appearance and the feel of my skin. I have never had even looking skin and I can confidently say, I am on my way there! I hope you give it a shot too! What Dry Brush Should I Buy?